PEStalgia - what's the link between PES 2 and the Stars of Brazil? With the latest installment for our Contributor's Corner series, long-time PES fan Rich Fay looks back at the glory days of Pro Evolution Soccer 2, the 2002 World Cup winners Brazil, while discussing how the two changed his views on football forever. Ever since my early childhood, which mostly consisted of myself doing many mundane chores around the house as a way of earning permission to play on my brother's PlayStation, I have always loved loading up PES and playing as the Brazilian national team. It was early 2002, and I remember being given the day off of school to watch my beloved England play a huge World Cup quarter-final match against the South American giants. The day was Friday 21st of June; little did I know it back then, but this would be the day my love for this nation's footballing brand would begin. Despite the fact that this Brazilian side were absolutely tearing my England to shreds, I watched in amazement because clearly, this team clearly wasn't your average side. Ronaldo, Rivaldo and of course Ronaldinho - and the rest - they were all magnificent. Watching them glide the ball effortlessly around the pitch before finishing the play with a superb flair move, executing it to deadly effect; seeing football like this changed my views on the game forever. Konami released Pro Evolution Soccer 2 later that year, and similarly to that Brazil side, PES 2 became the game which invited me into the wonderful world of video gaming - and most importantly, it became the game which made me fall in love with the fantastic footballing series of Pro Evo. After watching Brazil achieve World Cup glory earlier that year, I really wanted to emulate - to the best of my ability - the exciting style of football I had been fortunate enough to see earlier that calender year. Unfortunately, at the time, my brother wouldn't allow me to have my own Master League save, as if I had used up some of the space on his incredibly expensive PlayStation memory card, that would have prevented him from having any suitable space left to use himself - in his opinion anyway! With that, I found myself playing an assortment of Exhibition matches on two-star difficultly (which I still find rather impressive for an eight-year-old) over and over again. One match sticks out as a classic, when I took over Brazil and managed to conquer Iran with a particularly convincing 7-2 scoreline! The goal of the game being an audacious 30-yard lob from R.Larcos (or more commonly known as Roberto Carlos). Like many goals you were able to score on that game, it was simply stunning. Unlicensed names aside, led by my experienced strike force of Rivaldo and Ronaldinho, I was keen to take the PES world by storm, and to one day rival my brother's quite exquisite Master League team - which consisted of Roy Keane, the hard-hitting captain of Aragon... and Emile Heskey, the mighty striker of Europort. Licenses have come a long way since, but even with the small inadequacies, I believe PES has always been the game to emulate the accuracy and sheer jubilation of the world's most beautiful game. Yes, it might throw out a dodgy animation or two at times, or give you a ridiculously unfair result every now and then, but this is what makes the overall game so enjoyable given the hours of entertainment it brings. From the tight tussles in midfield to those freak-goals which have most unlikely of source, PES 2 - in my opinion - set the bar for all football games. The genre might have moved on in terms of features and graphics, but for me, I find it sad to realise that there may never be another game that will give me as many wonderful memories like PES 2 did all those years ago. 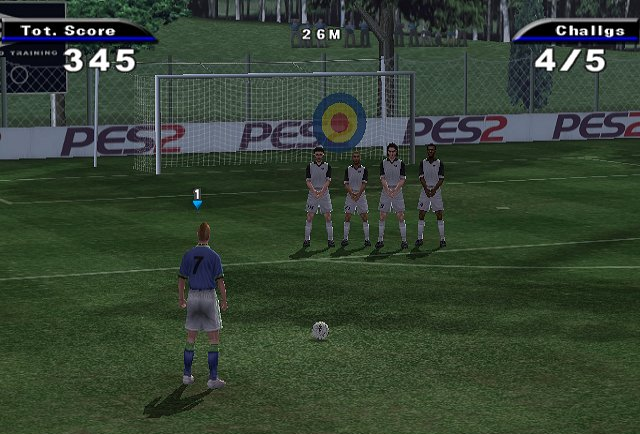 Sticking with the nostalgic goodness, do you have a favourite PES memory you want to leave in the comments section below? If so, let us know which PES title it was on, and also the reason why it is your ONE favourite memory. Want to write for Only Pro Evolutions? Do you have something to contribute for the front page? Get in touch using the Contact page.